We welcome and affirm people of all abilities. We have taken the following steps to assure that everyone is able to fully participate in the life of our church. 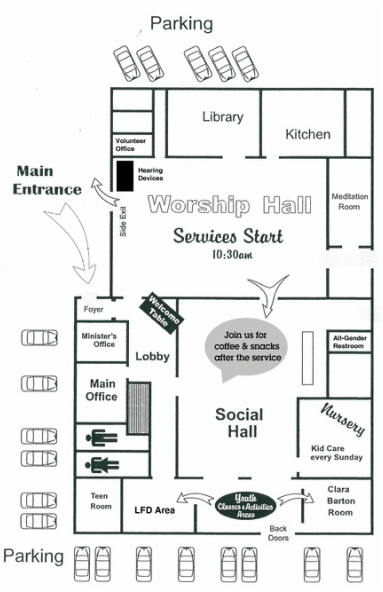 Our sanctuary, fellowship hall, and religious education classrooms are fully accessible to those using wheelchairs or having limited mobility. Large print hymnals are available. Please ask any usher for assistance. If you would like an orientation tour of the campus during the week, contact the church Administrator to make arrangements. We have assisted hearing devices available at the audio visual table in the back of the worship hall. If you want your child to participate in the religious education program and feel that they may require special accommodation due to learning disabilities or behavioral issues, please contact our Director of Lifespan Faith Development, in advance so the best possible arrangements can be made. Diversity is welcomed here. All are welcome to use whichever restroom that best fits their identity. An all-gender restroom is located in the rear of our Social Hall. This restroom also contains a baby-changing station and is equipped for those who are in wheelchairs or who have limited mobility. In order to accommodate our members, friends, and visitors who have asthma or other breathing concerns, we have a strict no smoking/no vaping/no tobacco use policy for our building and grounds. If you have any questions not answered or concerns not addressed, please contact the church Administrator to seek further information.